This beautiful Retreat Cottage offers exceptional quality decor and amenities. With an artful touch and delightful details, you will truly enjoy the elegant comfort of our newest home at Keowee Falls South! 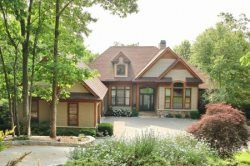 The Cliffs at Keowee Falls provides a spectacular collection, including homes and homesites with waterfront, golf and mountain views. Scenic trails, a Jack Nicklaus Signature Golf Course, that was honored by Golfweek Magazine as one of the Top 50 Best New Courses in 2008, and a grand clubhouse perched atop the most dramatic point in the community with sweeping views of no fewer than 10 of the 18 golf holes are just a few of the communities' amenities.